This is my first tutorial, so if you have questions please feel free to ask, especially if something doesn't make sense. I hope that I don't forget to explain everything. 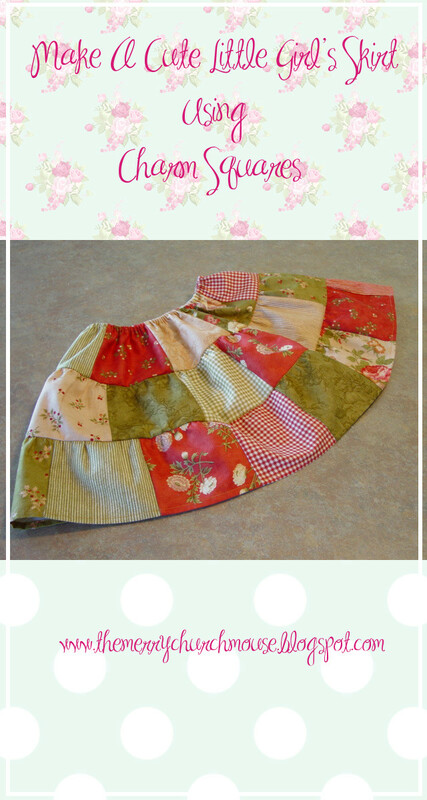 Please use this tutorial only for your own personal use and please do not sell skirts made from this pattern. 32 coordinating 5 inch squares of fabric. 16 inch piece of 1/4 inch elastic. * A serger is optional, but very helpful. 1. Arrange your charm squares in a pattern that is pleasing to you. These will be the tiers of the skirt. Keep in mind that the square on the far left will be joined with the one on the far right as well. There should be 8 in the first row, 11 in the second row, and 13 in the bottom row. 2. Sew these together in rows, just as you would a row of quilt blocks. I used a 1/4 inch seam on my serger, that way all of the seams are finished as you go. If you don't have a serger, you can machine roll and whip the edges by doing the seam at 1/4 inch with a straight stitch and then going back over the edge with a zigzag stitch set to a small stitch length. Almost a satin stitch length. Let the needle catch the fabric when it goes to the left and go off the edge of the fabric when it swings to the right. This will bind the edge of your fabric. It is very helpful to have a narrow edge or stitch in the ditch foot for this. Let the edge of the fabric follow the "fin" in the middle of the foot. This provides a nice finished edge, but does require some time. If you are using purchased charm squares that have "pinked" edges, you may choose not to finish the seams. This is fine, but your skirt will not have as professional a look on the inside. The choice is up to you. 3. Once you have your rows completed, fold each of them end to end with right sides together. Stitch them with a 1/4 inch seam. You should have 3 "tubes" of fabric now that looks something like this. On all tiers press the seams all in the same direction. 4. Take your bottom tier (the one with the most squares) and decide which edge will be the top and which will be the bottom. Also choose a seam to be the center back of your skirt. With your stitch gage and your iron. Turn your fabric wrong side out and press up 1/2 inch along the bottom edge. Fold the raw edge back under itself so that the raw edge meets the crease and press it again. (Alternately you could press up 1/4 inch and then press up another 1/4 inch.) Pin this if you need to, but try not to use too many pins as it can sort of distort the shape and it may be harder to sew. Beginning at your chosen center back seam and with the wrong side of the fabric up, stitch with a regular straight stitch on your machine all the way around, keeping close to the inside edge of the hem. Take a few stitches back and forth across the beginning and end to lock the stitches. Congratulations. You just hemmed your skirt! 5. Now take your top tier (the one with the least squares) and decide which edge will be the top edge. Fold down 1/4 inch and press into place. 6. Fold down another 3/8 inch (at the minimum). 1/2 inch is even better, I learned this the hard way, after all the pictures were taken. and press this into place. 7. Decide which seam will be the center back seam for this tier. With the wrong side of the material up, start sewing approximately one inch to the right (from the inside of the skirt) of the center back seam. Backstitch to lock the stitches in place. Stitch all the way around until you are about 1 inch to the other side of the center back seam and backstitch again to lock your stitches. ****IT IS VERY IMPORTANT*** to keep your stitching as close to the fold of the material (left hand side) without going off of it. You are making a casing for your elastic and you have to be able to fit the head of a safety pin past all of the seams in the tier. If you go off of it, just go back over those spots, otherwise you will have wierd gaps when it is gathered with the elastic. 8. Take your bottom tier once again and using a long straight stitch (I set mine at 3.5), begin at the center back and sew a line of stitching 1/2 inch from the raw edge of the fabric and again 1/4 inch from the raw edge. Be sure to end your stitching without any overlap. Leave the thread tails a few inches long for this step and be careful not to catch them when doing the second line of stitching. Do the same to the top edge of your middle tier as well. 9. Take your bottom tier and take the two bobbin threads from one end of the stitching you just did and GENTLY pull on them. Slide the gathers along the stitching gently working them around the tier. You may also pull the bobbin threads from the other side if needed to gather the material. 10. Take both the middle tier and the bottom tier and place them right sides together with the bottom edge of the middle tier to the top edge of the bottom tier. The middle tier essentially will be inside the bottom tier. Keep working the gathers and spreading them evenly until the top edge of the bottom tier fits nicely onto the bottom edge of the middle tier and the edges are flush. Pin in place every few inches as you go, placing the pins perpendicular to the edge. 11. Return your machine to its normal stitch length. Stitch this seam on your machine with a 1/2 inch seam allowance beginning and ending at the center back seam and backstitch to lock your stitches. The trick to getting nice gathers is to keep them perpendicular to the line that you are stitching. GO SLOW and take your time, stop every few inches and straighten things up. I like to use my "needle down" setting on my machine. This means that every time I stop stitching, the machine will stop with the needle down in the fabric. This is helpful if you need to lift the presser foot in order to straighten your fabric. It will keep the fabric from sliding out from under the presser foot. If you don't have this feature, just remember to lower your needle if you need to lift your presser foot. 12. Use this same method to gather the top edge of the middle tier (now joined to the bottom tier) to the bottom edge of the top tier. Once this is done, you may finish the seam edges in any manner you please. If you are using a serger, I would suggest using a slightly smaller seam allowance than the 1/2 inch used to gather the tiers together. This way you ensure that you are not cutting the threads that are holding everything together. I did 1/4 inch seams on mine with the serger. DO NOT try to skip stitching the seams together on your regular sewing machine and try to go straight to the serger! I have done this on a different project and cut my gathering threads, it wasn't pretty! If any of your gathering threads are showing on the outside of the skirt it is ok to remove them after the seams are secured, if you like. Press the seams toward the top of the skirt, being careful not to crush the gathers. 13. Now take your 16 inch piece of 1/4 inch elastic and secure a safety pin to one end like this. 14. At the center back of the waist band insert the head of the safety pin in the opening that you left in the casing. It is important to feed it through in whatever direction you pressed the seams. If you don't, the head of the pin will get hung up in the seams and will be really difficult to feed through the casing. Slide the pin through the casing, sliding the material down the length of elastic. Be careful to leave a couple of inches of the other end of the elastic exposed at the opening, don't pull it into the casing or you will have to start this step over again. Keep sliding the pin through the casing until it comes out again at the center back opening. 15. Now, pull both ends of the elastic out several inches away from the skirt waist, overlap them and pin them together. You aren't worried about even gathers at this point, you need to have enough elastic exposed to get it under the needle of your machine. 16. Keeping this as straight as you can, which can be a bit tricky. Place this under the presser foot of your machine with the pin still in place. Lower your presser foot, then lower your needle by hand to hold the two layers of elastic together, and then carefully remove the pin. Stitch the two layers togther carefully on your machine. Make sure you go back and forth over it a few times to make sure they are securely attached. I use the forward and back stitch on my machine to do this. 17. Last step!!! Stretch the elastic so that the ends go up into the opening at center back. Stitch the opening closed being careful not to catch the elastic in the stitching. You may need to stretch the elastic a bit as you are sewing in order to keep the material flat. Make sure to lock your stitches at each end. Adjust the gathers evenly over the elastic and you are all done! Have fun and let your imagination run! There are lots of possibilities for this little skirt. You can change the size of the squares to make it smaller or larger, you could add more squares to make it fuller. If you decide to try and make it fuller, I would suggest not going any more than a 3.5:1 ratio. That meaning, if the bottom edge of a tier were to be for instance 10 inches, I would not go any more than 35 (or 3.5 times the distance) inches with the piece that you are trying to gather onto it. There comes a point where you have too much fabric and it just won't all fit. Lighter fabrics can use a higher ratio whereas thicker fabrics should use a smaller ratio. Instead of hemming the bottom tier, it could be trimmed with lace or rickrack. I would do this step before joining the ends of the bottom tier strip together. You could do decorative stitching along the edges of the tiers. There are lots of fun things that can be done with it! If you decide to make one, I'd love to see it! Oh this is so cute! I will link this the next time I do a "links" post. Also, did you know that Sew Mama Sew is having a Kid's Clothes Month in September? I think you should send in this tutorial so other can use it. Great work! This is adorable!! Excellent job on the tutorial too! That is beautiful! I always wonder what I could do with those fat quarter packages, since I don't quilt. Thanks for the tutorial! I made one today!! It's on my flick page. Love it! This will be a great use for all my scraps. Thanks for sharing! I have just discovered some of these tutorials and yours is the best I have found so far. I found this because I was trying to find a better tutorial for the pettiskirts than the one at Martha Stewart's site. That one is just not clear enough for my abilities. Yours is very clear and thorough. thanks. Thanks so much for posting this! You are such an excellent, exacting seamstress! If only I had the patience to whip out my little seam measurer...WOW! Great tut on how to do the gathers, too....mine always end up wonky. I will definetly do it your way next time! Absolutely gorgeous and what a great tutorial! I just finished making one in red white and blue prints for my 2 year old. I added a waist band because I wanted to use no roll elastic and it was so easy to make thank you! I also split my gathering stitches in to two sections on each skirt tier to make the gathering threads easier to pull and less likely to break. Thanks so much for this tutorial. Sarah from New Zealand. I am so excited!!!! Thank You Thank You, Thank You! Absoultely ADORABLE!! Thanks for the tutorial...it's been printed out now and placed in my to do pile. i'll send a pic over when i'm done. THanks again!! Such an easy tutorial! I made one today and love it! thanks! Thanks for this detailed tutorial! My daughter loves her new skirt and didn't even want me to finish sewing the casing for the elastic before she could wear it. I'm planning to make more for Christmas presents. I added an eyelet fringe in between each layer but otherwise followed right along with your tutorial. You can see the results here. congratulations for you original idea for a beatiful skirt. I have been to one fabric store after another trying to find a skirt pattern like this one or the twirly skirt pattern that you have posted but WITH POCKETS. I cannot make my daughter anything with pockets. I do not care if they are on the inside or outside of the skirt. Where would she keep her littlest pet shop or money for the concession stands at the ballgames. Would you be willing to do a tutorial showing how to do pockets on girls size 8 skirt? Just curious. blog tutorial. I wish I could attach a picture. I have a digital one but I don't think I can attach it here. This was my SECOND skirt from one of your tutorial. Previously I made a "Twirly Skirt". I couldn't get this one to print. Only the sides printed???? Thanks so much for this tutorial! I just made one today for my daughter. 3rd sewing project I've ever done and it was simple. So far I've made a large tote bag, a pillowcase and now this skirt. Thank you for the great pattern/tutorial! My 13 1/2 year old had outgrown her skirts & needed a new skirt for a school assignment Unfortunately she didn't tell me until 10pm. She jumped online and found this blog. We rummaged through the scrap box, cut, sew, and 2 hours later - success! She loves it and wants another. Thanks again for helping save the day! Linked to your blog, loved this tutorial. :) Thanks!! This was a great starter project. I absolutely loved it. I just finished and can't wait to see my daughter in it. I want to make this for dd, a size 2T. Any suggestions on sizing for the squares, or how many I should use? TIA! Just finished a skirt for my daughter, thank you so much for this tutorial, I was able to follow perfectly! She is 7, and skinny, so I did four layers, 8, 10, 11, and 12 squares. I didn't want it to flare out as much. I used a wider waistband (3/4"), and sewed the bottom layer inside out to create a fringe above it. It turned out Super cute! I also french seamed the entire thing, as I don't have a serger, which was a serious pain, but made for some nice edges. I don't think I can add a picture, sorry :) Thaks again! Keep 'em coming! Almost beginner sewer here. Love the skirt tutorial, but I am very lost at step #10 (placing tiers together). I am playing around trying to see how it will turn back outward once again. Maybe a picture showing this would be helpful? Yippee! I got it :) Love, love, love it :) I will see if I can finish and post pics soon! Thanks so much! I would love to make this for my niece for size 1-2. Can I just cut this "recipe" in half for the number or squares or is there a better way to do it to size it down? Hi! I think to do this for a size 1-2 I would instead use 3.5 or 4 inch squares and go 10, 15, and 23 for the three tiers. You should wind up with a skirt in the neighborhood of 8.5-9 inches or so in length then. Waist should finish at about 19-20 inches, so I would cut your elastic at about 18-19 inches. I am basing this on a 1.5x increase for each tier and using a square size that when multiplied by 3 winds up being slightly longer than the desired finished length to accommodate the seam allowance, hem and elastic casing. Using smaller squares will help keep the look of the multicolored charms and keep it in scale with the size of the skirt. Thank You!! Your tutorial was very well done and easy to follow. I made my 4 yr old daughter one using fall colors, I wanted her to have a nice skirt to wear for Thanksgiving. Easy to make and my daughter loves it. Looking forward to trying another one of your tutorials. Thanks! Positively adorable; can hardly wait to use my Quilting left-overs for this.. I will be sewing this soon! !